The first of the tomatoes have started. 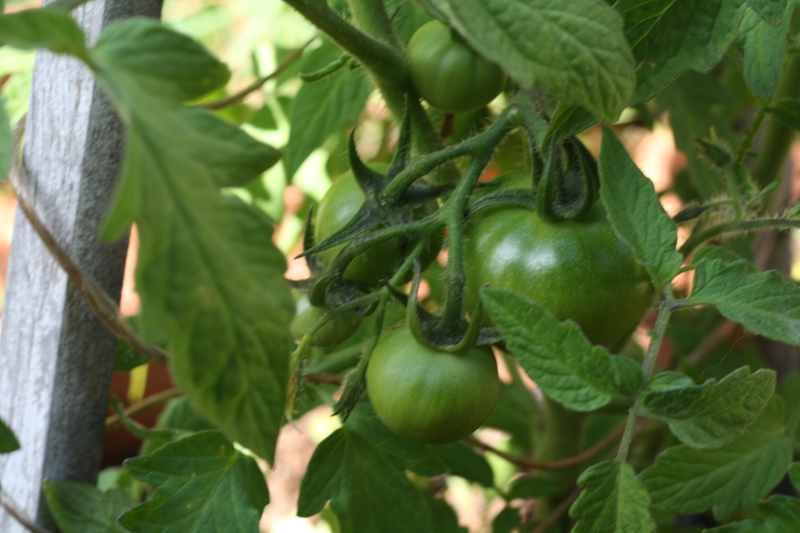 Right now they are small and very green, but within 6 weeks they will be ripe and ready for picking. Since we don’t have a garden I have the tomatoes growing in big pots on the patio. Not too far from the spaceship. 1. Tomato sandwiches. My cousin Dan introduced me to these 35 years ago. We would make them with white Wonder bread, the only bread any of us ever ate back in the 70’s. The key for this sandwich is great tomatoes, but the other thing is salt, pepper and mayonnaise. 2. Sliced tomatoes topped with burratta cheese and a drizzle of olive oil. Again don’t forget the salt and pepper. 3. Roasted tomatoes. Heat the oven to 350 degrees and slowly roast for about 30 minutes or so. The tomatoes will lose some of their liquid and the flavor will be intensified. Put the tomatoes in a bowl with the remaining juices. Season with salt and pepper. Drizzle with olive oil. Grill some bread and spread some of the tomato juice on the bread. 4. Roasted tomato salsa. Take the roasted tomatoes and place in a blender with garlic, roasted jalapenos, diced onion, lemon juice, fresh cilantro and salt and pepper. Blend, chill. and serve. 5. Tomato and basil linguine. Using a paring knife cut a few tomatoes into small pieces holding the tomatoes in your hand over a large bowl so that all the juices drip right into the bowl. Tear some fresh basil and add it to the bowl. Season with salt and pepper. Cook the linguini al dente. Reserve a quarter of a cup of the water and then drain the pasta. Immediately add the pasta to the tomatoes. Mix thoroughly. If too dry add a bit of the water. At the end, mix in some freshly grated Parmesan cheese. Before serving drizzle with a bit more olive oil. What do you guys do with your garden fresh tomatoes?